PETRONAS Twin Towers KLCC, Sunday, 23rd October 2011 – The “Yamaha 135 LC Street Stylers” riding convoy to the Malaysian Motorcycle Grand Prix 2011, organized by Hong Leong Yamaha Motor was jointly flagged-off at the KLCC landmark by Mr. CH Ng, Managing Director of Hong Leong Yamaha Motor Sdn Bhd, and En. Hashim Wahir, Group Chief Executive Officer, KLCC Holdings Sdn Bhd and witnessed together by En. Mohd Shobri Abu Bakar, General Manager, Lubricant Business Division, Petronas Dagangan Berhad (PDB) and Mr. Leong King Choon, General Manager, Sales & Marketing of Hong Leong Yamaha Motor. 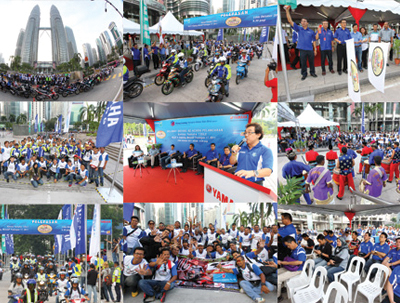 The “Yamaha 135 LC Street Stylers” attracted an overwhelming number of participants this year, at 902 participants which is a record compared to previous year’s 808 participants. The biggest group of riders hailed from Klang Valley involving 517 bikers, followed by 192 from the North and 193 from the South & East part of the peninsular. In appreciation, each participant was given a Main Grand Stand ticket, a Yamaha Factory Racing 50th anniversary T-shirt and a meal voucher. All participants also enjoyed the ride fueled by the F1-inspired PETRONAS PRIMAX 95 XTRA sponsored by PDB. “We, Hong Leong Yamaha Motor and PETRONAS, thus far have established a successful business relationship in several areas other than Motorsports. And this particular event with PDB, the official FUEL (PETRONAS PRIMAX 95 XTRA) sponsor, is another testimony to our collaborative work,” said Mr. Leong King Choon, General Manager, Sales & Marketing, Hong Leong Yamaha Motor. 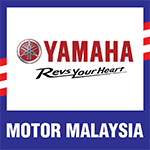 Hong Leong Yamaha Motor has been actively organizing “Yamaha 135 LC Street Stylers” riding convoy to witness the Malaysian Motorcycle Grand Prix races since 1996. These riding convoys have continued to provide an exciting opportunity for its bikers to enjoy riding as a leisure activity as well as to meet new friends within the biking fraternity. Thus, creating a platform for the bikers to enjoy biking life-style without getting involved in unhealthy biking culture. It is also an event deliberately organized to indirectly inculcate road safety-consciousness amongst bikers. Hence, all riders are constantly monitored and supervised by our marshals throughout the journey to ensure traffic rules and regulations are strictly observed for safety of the participants.